In an effort to minimize their environmental footprints a large number of schools are getting involved in paper reduction projects. This is an important issue for institutions of learning as they are responsible for a larger than average share of global paper consumption. Paper production comes at a very high environmental cost, it is also a major source of climate change causing greenhouse gases. Paper is resource intensive requiring large quanties of trees and water. Paper is not only a major contributor to deforestation and drought it is also a leading source of pollution. We use massive amounts of paper. On average every single person on Earth uses more than 2 sheets of paper every hour. In the USA, Japan, and Europe an average person uses between 250 and 300 kilos of paper every year. Thus far in 2017 we have produced almost 400 million tons of paper. Despite the dawn of the digital age the demand for paper is expected to double between 2005 and 2030. The pulp and paper industry is a big contributor to the problem of deforestation. Producing 1 kilo of paper requires 2-3 times its weight in trees and 55 percent of the global paper supply comes from newly cut trees. Around 40 percent of the world’s commercially cut timber is used for the production of paper. Each year more than 30 million acres of forests dissappear. The production of paper uses energy that emits greenhouses gases (GHGs). The paper industry is the 5th largest consumer of energy in the world consuming 4 percent of the world’s energy. Most of the energy used to power these mills is derived from GHG emitting fossil fuels. To produce 1 ton of virgin paper, it is estimated that 253 gallons of gas is used. The process of creating paper also emits carbon dioxide (CO2) and when paper rots, it emits methane. When it is burned or composted it emits CO2. The pulp and paper industry is the single largest industrial consumer of water in Western countries. It takes 10 liters of water to produce a single sheet of paper. The pulp and paper industry is a major source of soil and water pollution. Pulp and paper mills discharge water laced with dissolved solids including lignin and alcohol as well as inorganic material such as cholates and chlorineand metal compounds. Not only does paper production result in pollution, paper itself is a substantial part of the waste we generate. Paper comprises around 40 percent of the waste in the US. One of the most effective solutions to the problems associated with paper involves increasing the rate of recylcing. This would reduce the demand for resources and decrease waste. Each ton of recycled paper can avoid the use of 17 trees, 1,440 liters of oil, 2.3 cubic meters of landfill space, 4,000 kilowatts of energy and 26,500 liters of water. While recycling is critical more needs to be done to reduce or even elimiate paper. Many schools have instituted creative ways of decreasing paper consumption. Some schools are trying to end paper use altogether. Yale University announced that it was going entirely paperless and there are a number of paper reduction initiatives at univeristies all around the world. At the University of Alberta there is the Paper Cut - Campus Sustainability Initiative. Some other examples of schools with paper reduction initiatives include Griffith University, Penn State Berks, McGill University, Tufts University, and University of Arkansas. In fact almost every university has some sort of paper reduction plan as part of its sustainability program. 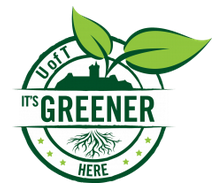 The University of Toronto has a Green Course Certification program. The St. George Campus program recognizes courses where steps have been taken to reduce the use of paper. This simple program aims to reduce paper usage by reducing the waste generated through environmentally friendly practices such as double-sided printing, single spacing, and online assignment submissions. To have a course certified instructors must provide a self-assessment. The instructor of certified courses are given a PowerPoint slidedeck to share with their students.